I have had a pretty stressful week, so no projects have been started or finished. That makes me very sad. To improve my disposition, I decided to share a project I did last Valentine's Day. This was part of a 4 part tag class that I taught last year. I now use it as part of my Valentine decorations on my bookshelf. It is a simply tag, but owe so cute. 1) Ink entire tag with Aged Mahagony Distress Ink by Ranger's Tim Holtz. 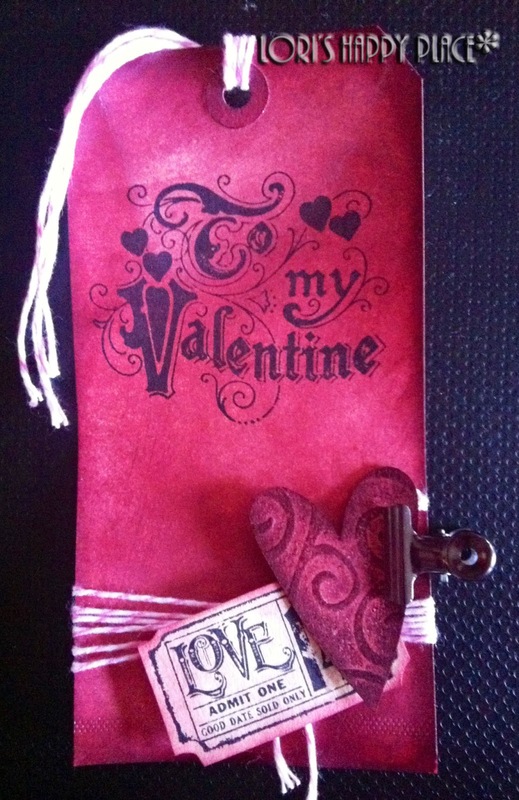 3) Stamp Tag with Happy Valentine's Day Stamp and black ink. 4) Cut a heart out of Tim Holtz Grungeboard. Emboss the heart with any background embossing image you like. Then Ink the heart with Aged Mahagony and Black. 5) Tie Pink and White Time around tag and to hole in tag. 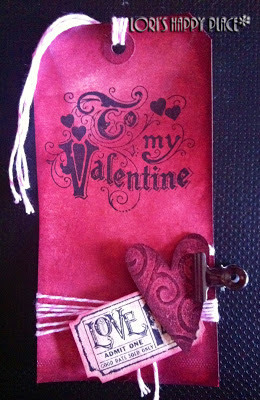 6) Stamp Tim Holtz Love ticket onto white cardstock. Ink edges with Aged Mahogany. 7) Attach ticket and heart to tag with Dimensional Glue Dots. 8) Add a Tim Holtz Hinge Clip to side of tag. create, enjoy, and share some Valentine LOVE!!! It's beautiful and great that you use it as a decorative item around Valenitine's each year. Lovely tag Lori, sorry you are feeling stressed. This is an adorable tag! Gorgeous! The Valentines stamp is fabulous. I hope your week gets less stressful.